Office 365 – The phone number you entered has already been registered by someone else. 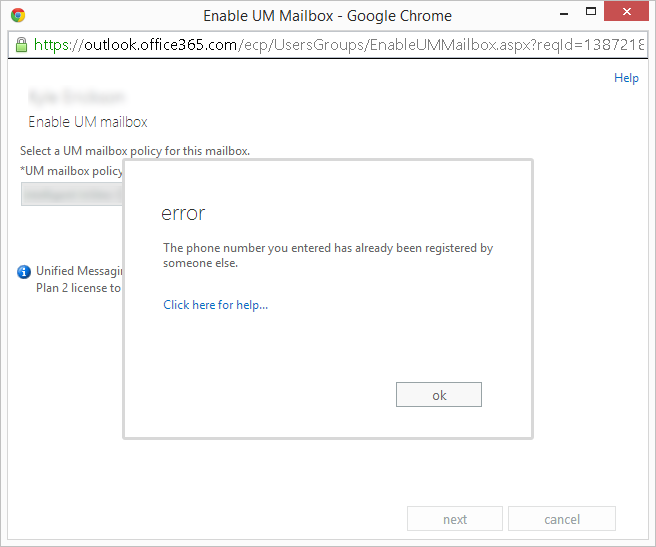 Symptom: You receive the following error when trying to enable someone for a Unified Messaging mailbox on Office 365 (Office 365 Admin Portal -> Exchange -> User Account -> Enable Unified Messaging -> Browse for UM mailbox policy). The phone number you entered has already been registered by someone else. Resolution: This was caused by having a duplicate UM Voicemail box number. You can run the following powershell commands to identify which user has the duplicate number assigned to them. This entry was posted in Office 365 and tagged duplicate number, Exchange, Office 365, um, unified messaging, voicemail on January 2, 2014 by Jack.